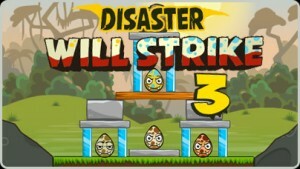 Disaster Will Strike 3 is a puzzle game on Kongregate. The objective is to break all the dinosaur eggs on the level, using a variety of disasters, such as high winds, earthquakes, and bugs. This is an enjoyable game, and if you like it, there are many more games in the series. Check out Disaster Will Strike 3 video walkthrough below, and check the bottom of the post for walkthroughs for other games in this series.